When it comes to charitable giving throughout the Santa Maria Valley, there is no name better recognized than that of Sue J. Sword. As the Co-Trustee of the Marian Mullin Hancock Charitable Trust, it is Sue who has continued Captain Allan and Marian Hancock’s local philanthropic leadership. Sue Sword has dedicated her life to philanthropy by furthering the Hancocks' tradition of charitable giving and building her own legacy of altruistic giving. For more than 50 years, Sue was a devoted employee, faithful financial advisor, and dear friend to the Hancocks. Marian Hancock quickly recognized Sue’s intelligence and high level of professionalism, which led to Sue’s eventual rise to the position of President of the Santa Maria Valley Railroad. Even to this day, Sue holds the distinction of serving as the only female president of a short line railroad west of the Mississippi. As a local leader of philanthropic giving, Sue has established a record of exceptional generosity, charitable responsibility, and has long supported just about every civic and nonprofit organization in the greater Santa Maria Valley. Sue served on the Marian Hospital Community Board and as one of the founding members of the Marian Foundation Board she is an Honorary Marian Foundation Board Member. Despite Sue’s lifetime of philanthropic service, she’s far from done. In 1993, Sue became a founding member of the Marian Foundation’s Legacy Society by including Marian Regional Medical Center in her estate planning as the Sue J. Sword Heart Center Endowment Fund. Additionally, she has long been a supporter of the Foundation’s need to establish and maintain an endowment to ensure a revenue stream for the future needs of the medical center. In fact, it was her visionary leadership and wisdom that played a significant role in the creation of the Foundation’s operating policies to steward growth of endowment funds. 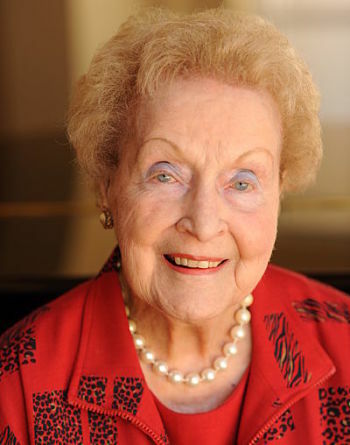 Her generosity has provided significant support to every major capital endeavor throughout the Foundation’s history. Most recently, Sue supported the Cornerstone Campaign to build the new hospital and in tribute to her generosity the colonnade outside the hospital main entrance is named in her honor. On behalf of Marian Regional Medical Center and the community at large, the Marian Foundation would like to express heartfelt gratitude to Sue for her legacy of service and generosity. Sue’s friendship and support of Marian Regional Medical Center is a special gift which will be forever treasured.